You can win up to £10 million betting on the unique Keno 24/7 that takes place every 4 minutes, every day of the week. Instead of entering the official draw, you place a bet on the outcome of the New York Keno (Quick Draw). Keno 24/7 works just like any other lottery — you pick your numbers and win a prize if you match those drawn. The amount of money that you win is determined by the amount of numbers that you correctly guess. At Lottoland, you are betting on the outcome of the draw. How Does Betting on Keno 24/7 at Lottoland Work? Instead of entering the official draw, you place a bet on the outcome of the New York Keno (Quick Draw) and the results of it can be found here. You pick the numbers you think will be drawn in the same way as if you had entered the official ‘Quick Draw’ draw. 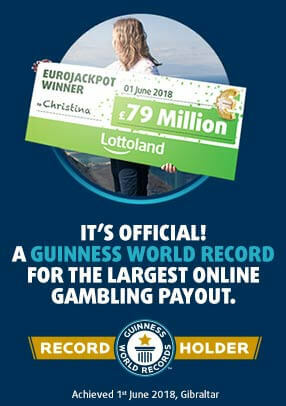 If you win, Lottoland will pay you out directly. Step 1. Pick your Numbers - Select between 1 and 10 numbers for each bet from a pool of 1 to 80 or use the QuickPick feature. The more numbers you choose the higher your potential profit. Step 2. Duration - Select how many draws you wish to bet on. More draws = more chances of winning. Step 3. Stake - Choose from x1 to x2500. Winnings are multiplied by the stake value. The higher the stake, the higher your winnings. Check out the helpful paytable below for more information about what you can win. You will win our jackpot if your 10 numbers are the same as those in the official New York Keno (Quick Draw). You can win all the same main game prizes betting on the draw with us as those available in the official draw, including the jackpot. The cheapest possible game is £1 for a single stake and the most expensive is £2500. In a Pick 1 game you can stake between £1 - £2500. In a Pick 10 game you can stake between £1 - £10. The amount of numbers you choose and the stake value determines the price for a game. Select each number in the bet slip individually or by using the QuickPick selection function at the top of the bet slip (Quick+1). Whatever the amount of numbers you choose will constitute a single game. Keno 24/7 has a jackpot of £10 million. Keno 24/7 draws take place every four minutes daily. When you bet on the outcome of the Keno 24/7 you will be treated as though you entered the official New York Keno (Quick Draw) draw and will receive the same main game prizes should you win. The more numbers you choose, the higher the amount you can win. However, if you chose less than 10 numbers for a single game, you can win more for each division of that amount of numbers. So, there is a trade-off between how many numbers you choose and the maximum amount of money you win for each prize division. Why should I bet on Keno 24/7 at Lottoland? With new draws taking place every four minutes, you can take the chance to become a millionaire betting on Keno 24/7 whenever you want.